After Bill Floyd’s retirement from his position as General Manager of the International Blackcurrant Association on 31st May this year, I am very pleased, honored and excited to take over this huge task. 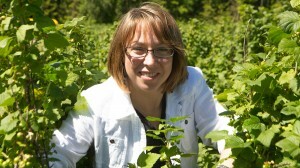 Bill has contributed a tremendous amount of time and energy to the development of an international blackcurrant family. Working only part-time as IBA’s General Manager, I also continue to work as marketing and communication manager at the Cassissium. The Cassissium is a museum dedicated to blackcurrants in France where I developed the scenography. And I am thus familiar with all the aspects of blackcurrants: culinary, agricultural, botanical, historical, medicinal etc. I am also in touch every day with people who discover the world of blackcurrants. And I can see that most of them know almost nothing about the wonderful qualities of our superfruit. This website and facebook will be our main tools to bring blackcurrants closer to the people. Today, blackcurrants only represent a tiny share of the global fruit market. But who knows: developing new products, putting together our experiences, and sharing our common passion with the world might lead to a growing demand tomorrow.